A bike and boat tour in the royal valley of the Seine in France showcases all that we love about France. This tour blends history, poetry, and natural beauty. You will start (or end, depending on direction) your cycle tour in Paris and then work your way through woods, gardens, medieval towns, and along flower filled canals. The same region that inspired the Impressionistic movement of painting will inspire you with its texture and color. All of the Seine Valley region is a moveable feast as you will discover for yourself. You will never forget it! Be sure to view all of our bike and barge tours in France. Only two electric bikes are on board the Fleur and are confirmed on first come/first serve basis. Additional electric bikes can be rented from third party but an additional fee will be incurred. Please note that the final mooring location will be provided one month before your tour date. Below you will find overall information on how to arrive close to general mooring locations. If starting point is Paris, from CDG, you will take an RER train to Gare de Lyon and the Port D Arsenal, close to the place de la Bastille, where the boat is moored. If starting point is Montargis, take a train from the airport to Gare de Lyon and then to Montargis. It is about a 1.5 hour train ride. To depart, from Montargis take a train to Gare de Lyon and then on to Charles de Gaulle. If your tour ends in Paris, taxi or train from the boat to the airport. Please check local weather conditions prior to departure. A good website to explore regional weather conditions including average high/low temperatures, average rainfall and more is weatherbase.com. Average high/low temperatures in °F for the area are: May, 64/49°, June, 70/54°, July, 76/58°, August, 75/57°, September, 69/52°, and 59/46°. On the Fleur, you can choose to cycle on your own with route descriptions. This is an easy to moderate bike and boat tour with average daily distances between 22 and 34 miles. Participants should be in good physical shape and comfortable with cycling around 25 miles before the tour. Most of the cycling is on relatively flat roads and in river valleys, but to enjoy the tour fully, guests should be able to manage (moderate) slopes of up to about 1.5 miles maximum. Electric bike. Available for a supplement. See pricing. Each boat has a different itinerary and vary in what is included, not included, and pricing. Be sure to view the details of the boat you are interested in booking. All distances are approximate. Itinerary is subject to change due to unforeseen circumstance, including but not limited to weather, last minute mooring changes, and restructuring of locks or bridges. 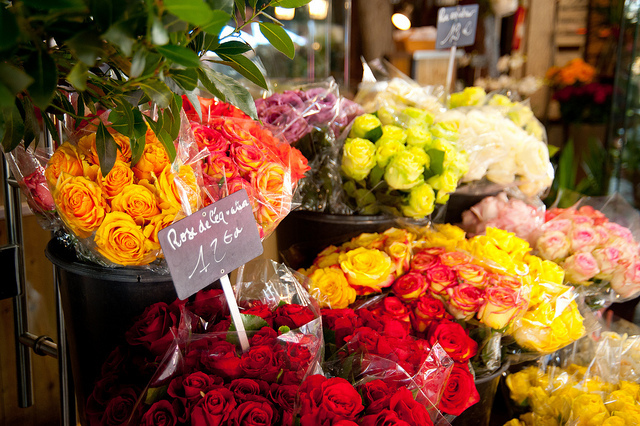 You will find the Fleur moored and waiting at the Rue du Port. Boarding begins at 2 PM. Upon arrival, at 3 pm, enjoy a welcome speech and crew introduction. at 4 pm, you will be fitted with your bike and instructed on safety. After that, you are free until 6:15 where you will be offered a welcome drink. Dinner will be served at 6:30. After dinner, you will have the opportunity to join the group for a town walk. Montargis, with its 15,000 inhabitants, is the biggest town of the Loiret after Orléans. Unfortunately, this former royal residence was destroyed by fire in the 16th century but the canals are still there. 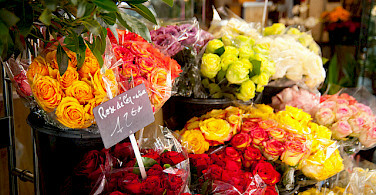 They are decorated with beautiful flowers and give the town a certain charm. From Montargis, cycle along the l’Ouanne to Château- Renard, where you can visit the ruins of a castle from the 10th century. Also, today is a visit to the Apiculture’s Living Museum. There you can see beekeepers and their bees at work, and you’ll be able to sample their delicious honey. No dinner on board this evening giving you the opportunity to explore on your own. Stay on board this morning as the boat cruises to the lock of Cepoy where you will disembark. Today's cycling tour goes through the forests of Montargis, northeast of the town. These forests are old and beautiful. The next stop is the medieval town of Ferrieres with its old town center, which has been beautifully preserved. In the middle of the narrow streets is a splendid monastery. After this, head west to the archeological site of Sceaux-du Gatinais. Today's final destination is rural Néronville. Today's route is through an old area, cultivated already in the Gallo-Roman era. Your first stop is the old Gallic stronghold, Château-Landon. Perched on a rocky promontory, its old houses, monuments, towers, and pretty terraced gardens form a very scenic picture with the narrow Fusain river flowing past below. The Abbey of St.-Severin dates from the 13th century. Here you will have a guided tour with a local guide. Later on, you find the rocks of Nemours on your way to meet the Fleur again in Nemours. Here you may visit the castle or the prehistoric museum of the Ile-de-France region. Today offers two possibilities. If you choose the long option, follow the valley of the Lunain with its old farmhouses and castle ruins. On the way, pass a fruit and a cheese farm. You might end up with homemade jam in your pannier. 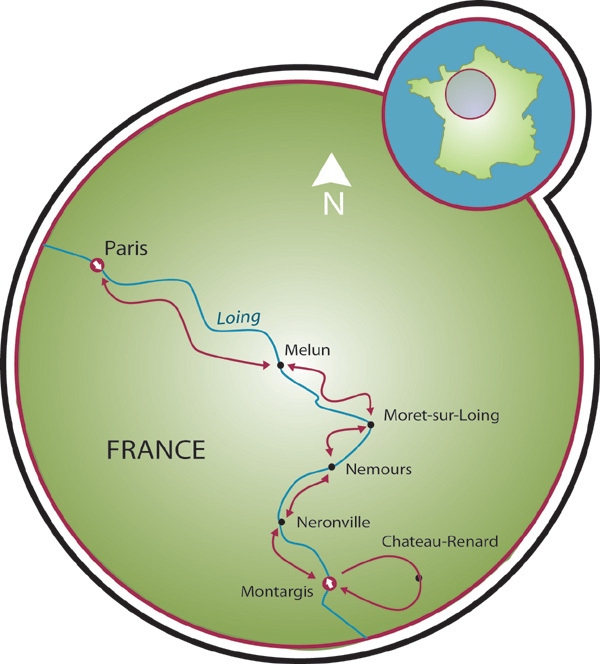 If you wish to cycle the shorter option, stay in the valley of the Loing and visit Grez-sur-Loing. In the town hall, a few magnificent impressionist paintings can be admired. Stay overnight in Moret-sur-Loing, a charming medieval fortified town, strategically situated on the banks of the Loing, where painter Sisley found inspiration for his beautiful impressionist paintings. You can also visit the house where he was born. Today, cycle through the wonderful forests of Fontainebleau. Your first destination is the city of Fontainebleau, with its palace, much in favor among the French kings, because of the extensive possibilities to hunt in the surrounding forests. In the castle itself, there is a museum of Napoleon, among other things. 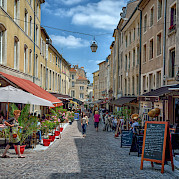 Fontainebleau is also a pleasant town to walk around or to shop. After this, continue your tour to the artistic village of Barbizon, where since the first half of the 19th century, many painters have found inspiration. At the time, a group of landscape painters formed the ‘school of Barbizon’. Here you can visit the local museum. Today's final destination is Melun, a town which is known as ‘le domaine des reines blanches’, because in former years it used to be the domain of the widows of the French kings. As you get closer to Paris, there will be more traffic to deal with. In the morning there is a short bike ride following the river banks of the Seine to the lock of Evry, from where you will board the Fleur into Paris. Enjoy a delicious lunch on board. The mooring place of the Fleur is the port d’Arsenal, not far from the Notre Dame. Arrival in Paris at 2 pm. The Fleur will be moored in the Port d’Arsenal near the Place de la Bastille or at the quai de Bercy, depending on your travel date. At 2:30 pm, you will enjoy a welcome presentation and crew introduction after which you will have free time in Paris. Be sure to return to the boat by 6:15 for a complimentary drink. Dinner will be at 6:30 pm followed by a town walk. You will enjoy a morning sail as you eat breakfast. Around 9 am there will be a safety presentation with your bike touring set to begin after lunch, from the lock of Evry. You stay along the banks of the river for a while. Final destination of your bike tour is Melun, a town which is known as ‘le domaine des reines blanches’, because in former years it used to be the domain of the widows of the French kings. After dinner, you can join the group for a stroll through the town. Today you will bike through the wonderful forests of Fontainebleau. The first destination is the artistic village of Barbizon, where since the first half of the 19th century many painters have found inspiration. At the time, a group of landscape painters formed the ‘school of Barbizon’. You can visit the local museum. After this, you continue your tour to the palace of Fontainebleau, much in favor among the French kings, because of the extensive possibilities to hunt in the surrounding forests. In the castle itself there is a museum of Napoleon, among other things. Fontainebleau is also a pleasant town to walk around or to shop. We find the Fleur again in Moret-sur-Loing, a charming medieval fortified town, strategically situated on the banks of the Loing, where painter Sisley found inspiration for his beautiful impressionist paintings. You stay in the valley of the Loing and visit Grez-sur-Loing. 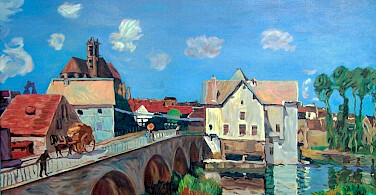 In the town hall of Bourron-Marlotte you can admire a few magnificent impressionist paintings. You meet the Fleur again in Nemours. There we may visit the castle or the prehistoric museum of the Ile-de-France region. Breakfast during sailing. Today we bike through a wooded area with rugged rocks. Before lunch, you will visit the sculpture garden Jardin Bourdelle. Final destination of today is rural Néronville. Today you start in Chateau-Landon, a beautifully situated town, where you visit the Abbey of St.-Severin which dates from the 13th century. The tour leads to the medieval town of Ferrieres with its old, beautifully preserved town center. In the middle of the narrow streets, you will find a splendid monastery. The final destination of today is Montargis, with its 15.000 inhabitants the biggest town of the Loiret, after Orléans. Unfortunately, this former royal residence was destroyed by fire in the 16th century. The canals remain and, decorate with flowers, have an old world charm. Today there is no dinner on board. You can select one of the local restaurants in Montargis. From Montargis you bike along the l’Ouanne e to Château-Renard, where you can visit the ruins of a castle from the 10th century. You will also visit an Apiculture’s Living Museum and see beekeepers at work, and you’ll be able to sample their delicious honey. You are expected on board between 12 pm and 2 pm. After arrival and welcome on board, you can enjoy your first ride of the tour into the countryside surrounding Montargis. Your day begins with an easy ride through a large forest of old oaks and beeches east of Montargis. Continuing north, you cycle along the river and canals featuring the Abbey of Ferriéres and Dordives Glass Museum on your way to Néronville, near the small town of Chateau-Landon on a hilltop. Today, you cycle on country roads to Nemours, a small town on the Loing River. 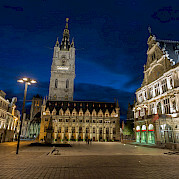 The highlights are the covered market of Egreville and the prehistoric museum of Nemours. 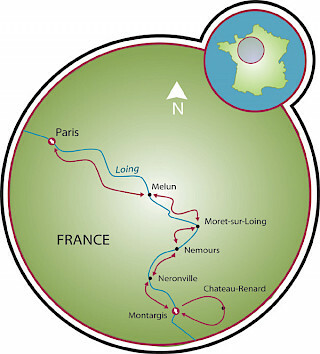 The Feniks sails from Nemours to St.Mammés, where the Loing and the Seine Rivers meet. The Loing is a narrow stream parallel to the canal, called by the same name. Heading for St.Mammés we will meet a number of famous rock formations in a forested region. After lunch, you can choose for a short(er) ride including a visit to Moret on the River Loing. 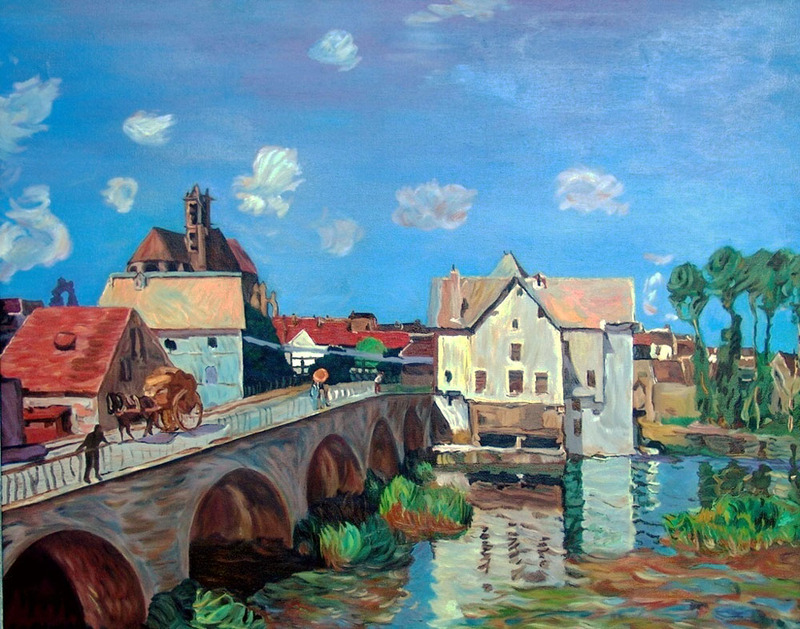 Moret-sur-Loing is famous for the painter Alfred Sisley who lived and painted there at the end of the 19th century. Another possibility is a ride in a lovely narrow river valley with a tea stop halfway. After some short but steeper slopes and nice views also this ride is leading to Moret-sur-Loing. From there to the mooring place in only a few kilometers. The canals with the many locks now are behind us. Downstream the Feniks can cover longer distances in a shorter time. We are now getting closer to Paris with now and then more traffic on the road. This region has an impressive history. Many places witnessed historic events. Many castles near Paris were used by French kings and nobility. Visit to the immense castle of Fontainebleau. Then a nice ride through the forest of Fontainebleau and a visit to the 19th-century artist's village of Barbizon. Along the Seine River, we cycle to Melun. Near Melun, you will find the Château Vaux-le-Vicomte (a nice example of a 17th-century castle with gardens in the French style and the impressive medieval castle of Blandy-les-Tours. Because of the distance today only one castle can be visited, but you can choose which one. They are near each other. We follow our way along the river, with some villages, pass patches of forest and are getting closer to the big city. A boat trip after the bike tour is a nice way to pass through the outskirts of Paris. Day 1: Arrival to Paris between 12 PM and 2 PM. Departure at 3 PM for a river cruise. Overnight in Evry. Please ask us for the detailed Paris to Montargis itinerary! This tour is run by Jossie Verkerk and Marius van de Westeringh. The crew and barge were just terrific. The food was excellent and plentiful. The French towns and scenery were a delight. One of my discoveries for this trip was that I think I prefer a self-guided tour to a guided one. The group was larger than what I was really comfortable with, as I like to stop for photos and wasn't comfortable doing that with the large group. (My spouse and I had just finished a 6 day self-guided tour thru Holland). The bikes were fine, but one of our group had constant problems with hers. The food was fine, but I prefer more options, and would have liked eating away from the lunch basket-type of fare we fixed ourselves from barge foods. I loved that the guides gave us interesting evening walking tours. The price was very reasonable - much below others we considered. Almost perfect in every way. Only bad was I wanted more of everything. Loved the crew, but Clive (our chef) was the best. I have since done another bike and barge trip with another company and was totally disappointed with the food we were served. I am looking forward to doing another bike and barge trip this year. We took this tour in July of 2010. We have used tripsite before and have loved the experience. But I have to say, that for the biking, we liked the Netherlands tour better. There weren't many sites open to tour. Cafes and restaurants were often closed when we got there. Having said that, the scenery was beautiful. The food was wonderful too. And it was a treat to barge our way into and around Paris. Thank you.